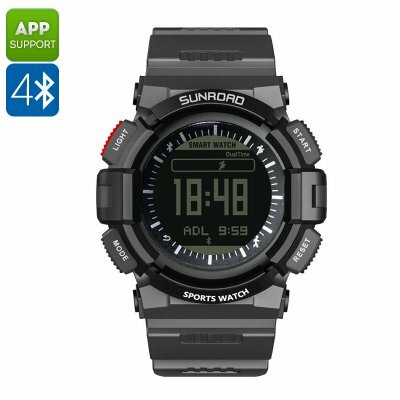 Successfully Added SUNROAD FR9211B Sports Watch - Bluetooth, App Control, Heart Rate Monitor, Weatherproof, Backlight, Sleep Monitor to your Shopping Cart. 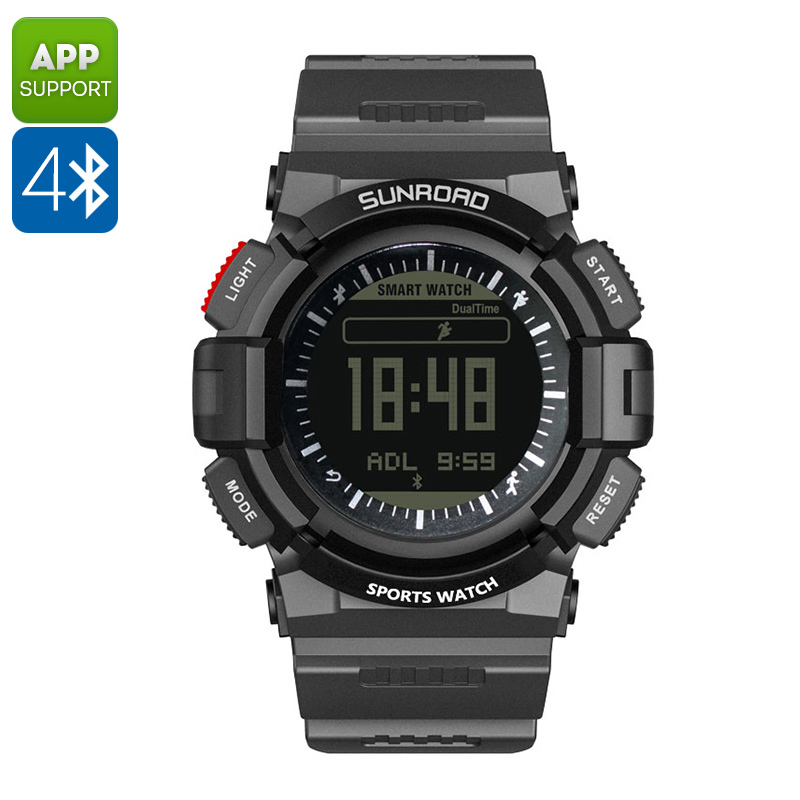 The SUNROAD FR9211B Heart Rate Monitor is a truly multifunctional sports watch that guides you to meet all your upcoming fitness goals in no time. Suitable for men and women alike, this smart health accessory comes packed with an abundance of features that lead you towards a healthier lifestyle. On its beautiful LCD display, it portraits the time and date, along with all sports tracking data when used during exercise. Featuring a backlight, this sports watch can even be used at night – allowing you to head out for a run after dark and still enjoy all its amazing features. Compatible with both iOS and Android smartphones through Bluetooth, it allows you to watch back and analyze the data obtained during previous sporting sessions on the dedicated smartphone app. Featuring a highly accurate heart rate monitor, this smart sports watch keeps you constantly up to date about your current heart rate. Additionally, this HRM provides you with a detailed exercise report after each sporting session – allowing you to analyze the way your body reacted to different exercise routines. Capable of tracking your maximum, minimum, average, and current heart rate – this smart health accessory provides you with an abundance of valuable information based upon which you will be able to adjust your upcoming exercise session. Besides working as a regular heart rate monitor, this smart watch also keeps you updated on incoming phone calls, messages, and previously set alarms when paired with your smartphone. Additionally, it also features a stopwatch, countdown, and speed monitoring feature that further increases its usability while sporting, as well as a sleep monitor that makes sure you get the right amount of sleep and recovery in between your workouts. With all these tools at hand, you can be assured to reach your future fitness and health goals in the fastest and most efficient way possible. Crafted out of durable ABS material and featuring a weatherproof design, this sports watch can be efficiently used in any weather condition. Rain, snow, dust, or ice – nothing will stop this heart rate monitor from assisting you throughout your upcoming workout sessions. With its powerful battery, it provides you with enough juice to get through multiple days and its battery change reminder feature makes sure that you’ll never run out of juice unexpectedly. The SUNROAD FR9211B Heart Rate Monitor comes with a 12 months warranty, brought to you by the leader in electronic devices as well as wholesale electronic gadgets..
Arabic: - مشاهدة الألعاب الرياضية - Chinese Simplified: - 运动手表 - Czech: - Sportovní hodinky - Danish: - Sportsur - Dutch: - Sporthorloge - French: - Montre de sport - German: - Sportuhr - Hebrew: - שעון ספורט - Hindi: - खेल घड़ी - Italian: - Orologio sportivo - Japanese: - スポーツの腕時計 - Korean: - 스포츠 시계 - Malay: - Menonton sukan - Norwegian Bokmål: - Sports Watch - Romanian: - Ceas sport - Russian: - Спортивные часы - Spanish: - Reloj deportivo - Thai: - นาฬิกากีฬา - Turkish: - Spor seyretmek - Vietnamese: - Thể thao Watch.